Q: How did you deal with the challenge of writing a portrait of someone you knew so well that is both candid and sympathetic? 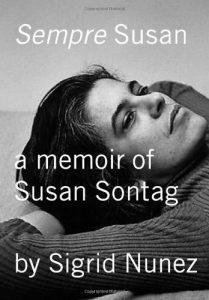 How would it have been different if Sontag were alive today? A: If she were alive today I would not have written a memoir about her. In fact, I wouldn’t have written a memoir at all if I hadn’t been asked to write an essay for an anthology about mentors, which is how this book began. But the important thing is, I was writing about someone I knew many years ago, and I could not have written about Sontag as I did without that kind of distance. It enabled me to be honest and fair and to understand things that I was too young and dumb and emotionally involved to see clearly back then. Q: Since you didn’t keep notes, how were you able to remember such specific and vivid tales about Sontag? A: I have a pretty good memory, but it wasn’t so hard to remember someone who was both extremely interesting and extremely important to me. The relationship I had with Sontag is something that has stayed alive in me, not a distant memory I have to struggle to recall. The events I write about are ones I’ve thought—and talked—about often since they occurred, and I took no liberties when writing this book. Everything I put down is exactly as I remember it. I’m not saying my memory is perfect, of course. I’m just saying I didn’t invent anything. I didn’t create any composite scenes or dialogue. Q: What is it like to write nonfiction after having been a novelist your entire career? A: This book turned out to be far easier for me to write than any of my novels. I didn’t have to come up with the characters or the story, and I didn’t have to labor over what should happen next or what the end of the story should be, and I didn’t have to do any research, either. Writing is always hard, but for this book the process was simpler. Q: How did your view of Sontag change after writing this book? A: I don’t believe my view of her did change. What changed was that she became a stronger presence—and, sadly, a stronger absence as well. I find myself walking in the city, looking around at everything and thinking, oh, but she is not here to see this. Q: What do you think Sontag’s response would be to the book? A: I think there are parts she would appreciate and other parts that would infuriate her. More important to me, though, is that I believe she would understand every word. I mean, even where she disagreed with something I wrote, I feel she would understand perfectly why it was there.